This city of over 800,000 people has enough dummies. So let’s look at how to enjoy this world renowned historic city as a smart tourist. Did you know that the city has the same number people as it has bicycles? 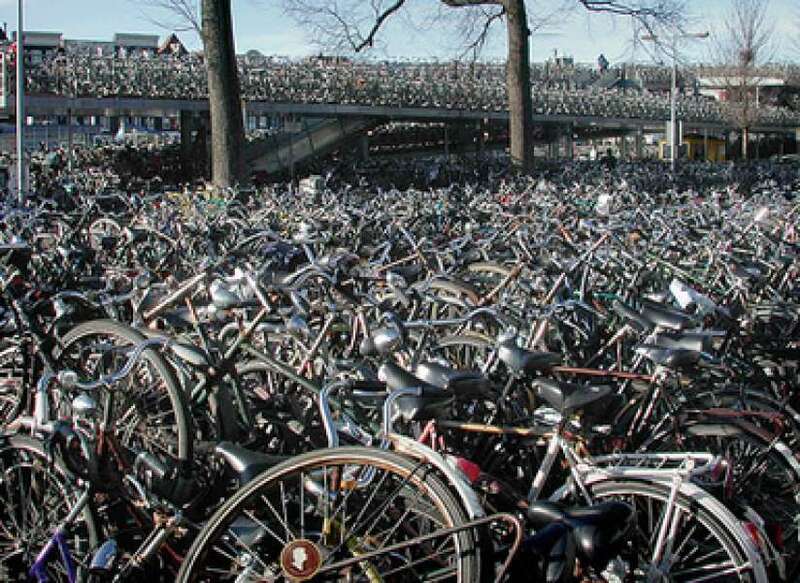 Ever wondered what over 800,000 bicycles in a city look like? When they rent them to tourists, amazing things happen – as you can see on any bike lane or intersection in the centre of this busy city. It’s a miracle that not more people get killed each day as they jump in front of bikes, get hit and run over… It’s fun to sit back and watch the Dutch as they maneuver traffic, traffic lights, speeding trams and hordes of pedestrians all while carrying children, instruments, groceries, and dogs on their bike AND while texting!Rather than jumping on a bike right away, it’s a good idea to get a sense of the layout of the city’s spiderweb-shaped centre by jumping on a boat. Taking a canal cruise will give you a feel for the water, the narrow roads, the tall houses and the history of this world heritage site. I learned all sorts of interesting facts, such as word origins, historic facts about trade and taxes and politics, as well as useful information on where to eat and which museums to visit. 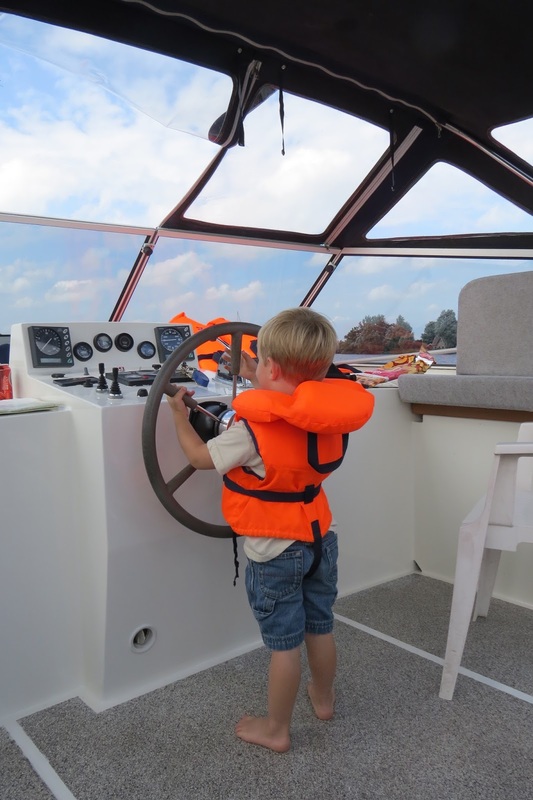 There are different companies to choose from and their cruises are slightly different. 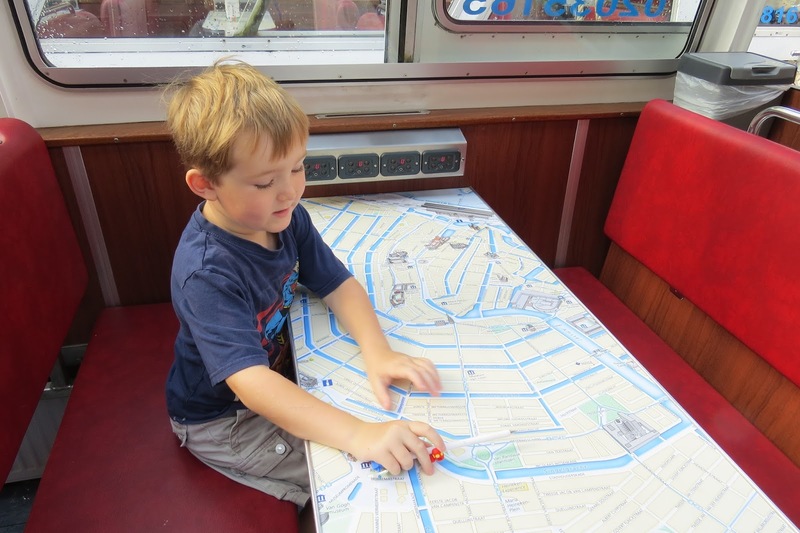 We used this one: http://www.amsterdamcanalcruises.nl and enjoyed the personal headsets and the tour of not just the inner city canals but also across the IJ and past the Scheepvaart Museum (ship industry). Because we had our extended family with us, on this particular trip to Amsterdam, we rented a house rather than a hotel room or hostel. The house had typical narrow staircases up three floors and offered 3 bedrooms and a kitchen, allowing us to make our own meals. A blue AH is the symbol for Albert Heyn, one of the largest supermarket chains in the Netherlands. They usually offer fresh bakings as well as many ready made meals. So lunch and supper were easy. One of the smartest thing to bring from home, is a small fold-up shopping bag! Grocery stores here do not pack for you and you have to pay for each plastic bag! I have one of those nylon bags that tuck into a tiny pouch – great for groceries, markets, books and extra on the airplane. Initially you have to pay 7.50 euros to obtain the card but it pays off since each ride using the card is almost half the cost of paying for individual tickets. You can use this card like a credit card by putting money on it and paying for all public transit: trams, busses, trains and more. You can even rent OV Chip bicycles using this card, at certain real stations. Another smart thing to do is to plan your travel by using this website: http://m.9292.nl/en (Notice that these websites are in English!!) Here you enter your starting point, your desired destination, date and time of travel and voila! The site presents you with all options and easiest ways of getting there. If a schedule in Holland says that the train will depart at 10:32 AM you can pretty well bet on it to depart at 10:32 and not a minute later. 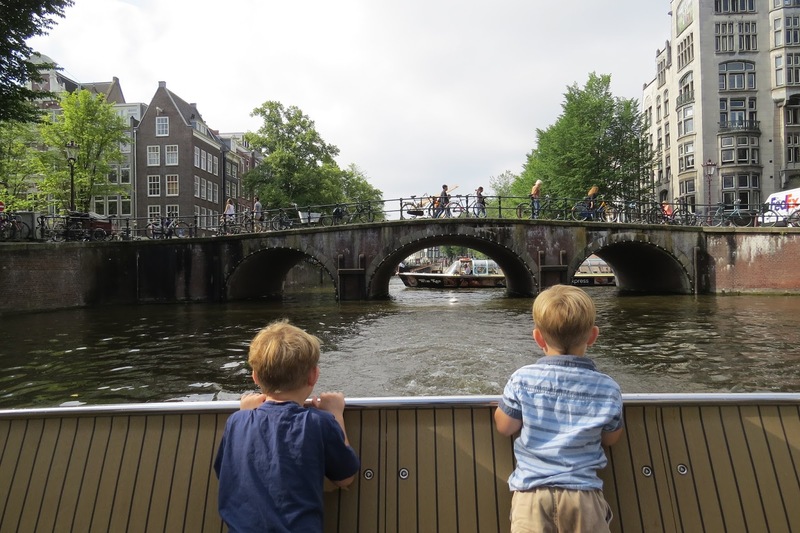 This will allow you unlimited, and faster, entrance into many museums including the fabulous Rijksmuseum with its Rembrandt paintings where you can spend more than a day; also the Van Gogh museum, Anne Frank House and many more. So, what’s keeping you? Come and visit Amsterdam and, while you are here, be sure to spend more time in this hospitable, interesting country below sea level! Tulips came originally from Turkey in the late1500’s to the Netherlands. So it seems only fitting that we, newly arrived from Turkey, immediately set off to visit Holland’s most famous garden: the Keukenhof. In fact, on our last day in Turkey we visited the palace of the very Sultan who gifted the first tulips ever to arrive in the Netherlands. What started with one bulb is now a major export industry. 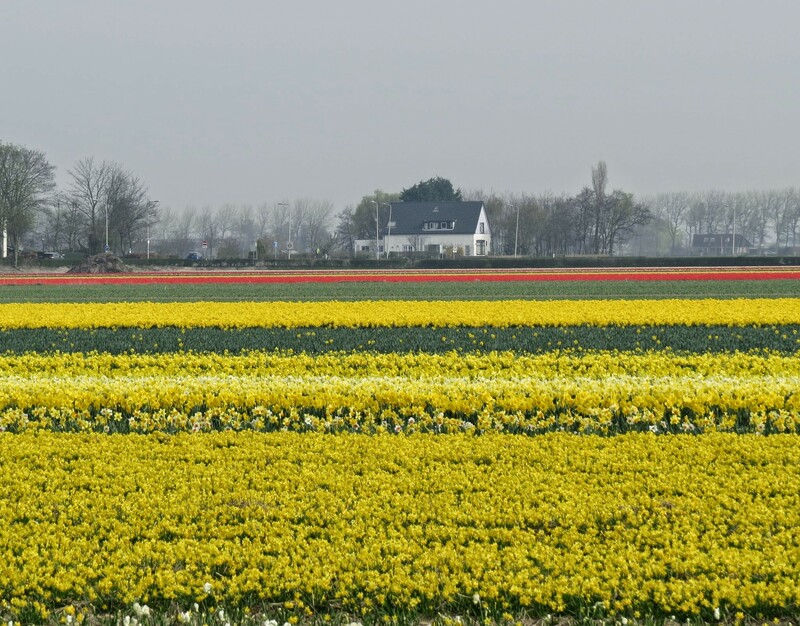 The Dutch brought tulips to countries around the world, including to Canada as a perpetual gift for hosting the Dutch Royal Family during the war. 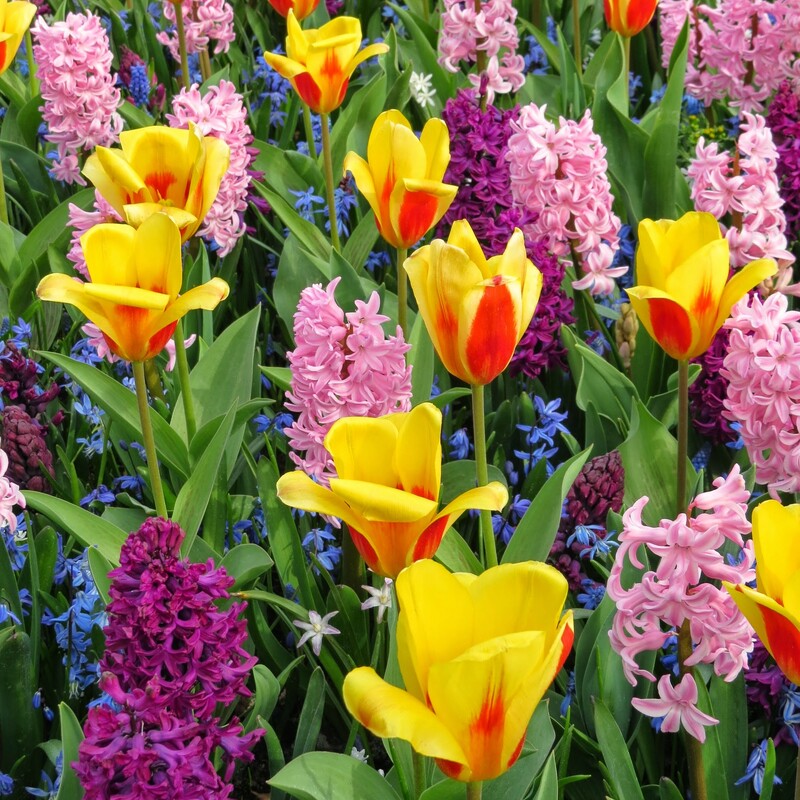 An enormous show garden, the Keukenhof has thousands of bulbs blooming at any given time in the spring. Beds are planted in such a way that there is a multitude of color, and fragrances, through the spring. We admired rows and rows of hyacinths, tulips, daffodils and other bulbs. Transportation in Holland is pretty impressive. If you ever plan to travel here, you might want to do the following: buy a OV chip card which you can use for all public transport. You start by buying the card at the airport or at a train station, or at supermarkets or newspaper/book stores. Throughout the country are special posts where you can upload credit, swiping your creditcard and then your OV chip card to load credit onto it. Each time you travel by tram, bus or train, you swipe your OV chip card when you board and when you disembark. Upon leaving the bus or train, the reader will show your cost and your remaining credit. Simply upload as needed. This is a fantastic system since it makes public transportation seamless. Just don’t forget to check out. Trains have a large number 1 for first class on the outside, or a 2 for the regular, economy class. Trains also now have many ‘silence’ compartments, in which you cannot have loud conversations or be on your cell phone! A wonderful bonus. 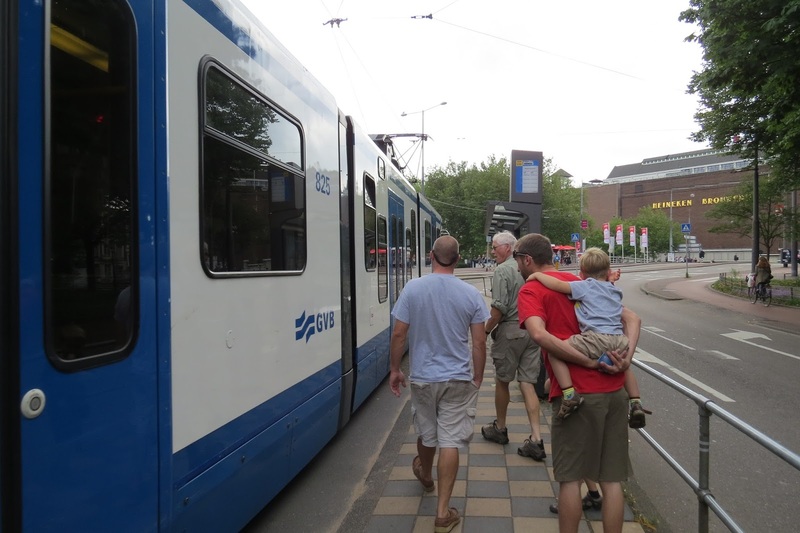 And while public transportation in the Netherlands is efficient, it is not cheap. To plan any trip, across town or across the country, access this website: www.9292.nl You can select any date, place and time here to see the most efficient way of getting somewhere. We bought a SIM card for our iPad so that we can access this great service anywhere in the country. 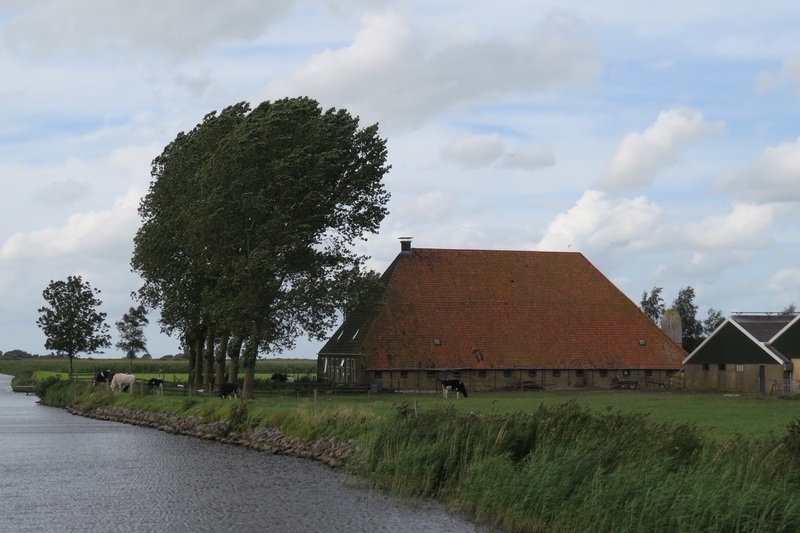 Today we traveled by train and bus from Amsterdam to the province of Drenthe – a beautiful, rustic part of the country with sleepy villages, gorgeous old farm houses and heather fields with flock of sheep. 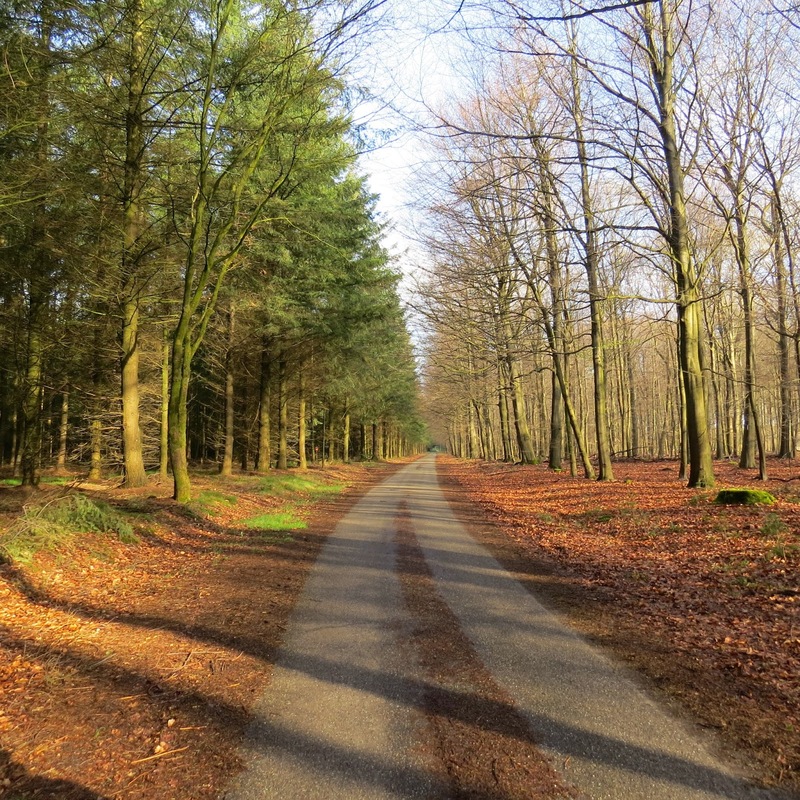 Here we will spend some time hiking the Drenthe Pad, a beautiful long distance trail. 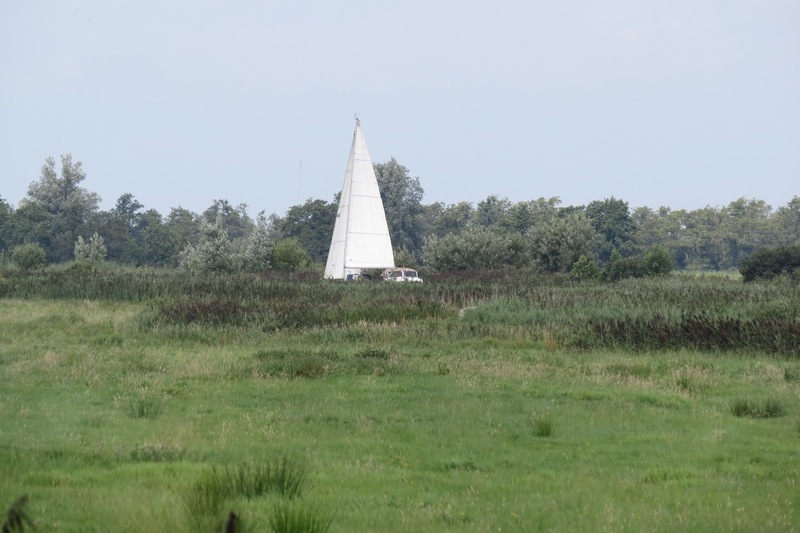 Right now, we are circumnavigating the province of Drenthe, which is in the north eastern part of the country. The Drenthe Pad is a hiking trail of some 325 KM. And it might well be one of the best kept secrets in the world of hiking. is a valuable addition. 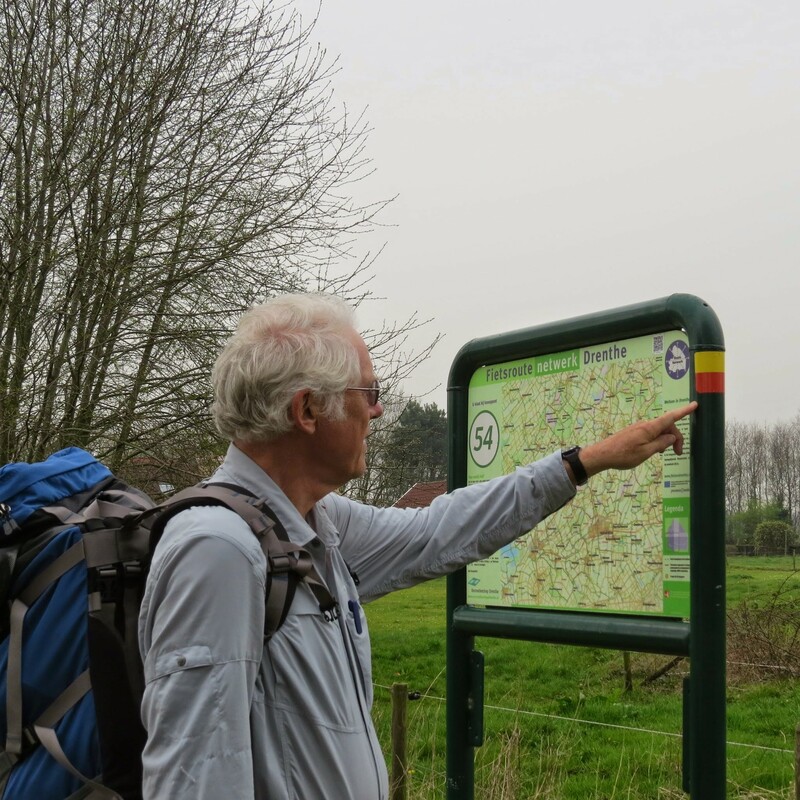 As far as I know this guide is only in Dutch but with the map and the signs anyone should be able to follow the trail. The terrain is relatively flat which makes it easy. And it is very varied: from ancient, sleepy villages you enter a quiet forest, cross a sandy path and walk along the moors (fields of heather which will bloom in August), then along a farm field, back into the woods. On the next heather field you might encounter a large flock of sheep, with or without a real live shepherd and his dogs. Today, just when I said “We haven’t seen any kind of wildlife!” a large deer slowly crossed the path. We heard woodpeckers and met a large flock of curious sheep with their newborn lambs. In a country of 33,889 square kilometers of land (13,084 square miles) and a population of nearly 17 million, the Netherlands is among the most densely populated countries of the world. However, on this trail we hiked for the last two days without seeing a soul until hours after we started. Yesterday, we saw two people all days. It is rare in this country not to see a church spire, or power lines or hear traffic noise. On this trail, there is complete silence except for the singing of many different types of birds. It is probably one of the few areas in the country where you can still get completely lost and wander. Usually most hiking trails here have an abundance of benches, picnic tables or little restaurants with a patio. In Drenthe you can walk 20 KM and not see one. But the wild swans on the lakes make up for not being able to order a coffee. We have walked from town to town and stayed in either B&B’s or local hotels. If you are planning a hiking or bicycling trip in the Netherlands, and there’s no better place to do either, you should join this organization: Vrienden Op De Fiets (Friends On Bikes): http://www.vriendenopdefiets.nl/nl/ (or .en for the English version). This fabulous network across the country offers accommodations in private homes, much like B&B’s, but at a cost of E19 p.p.p.n. including breakfast. 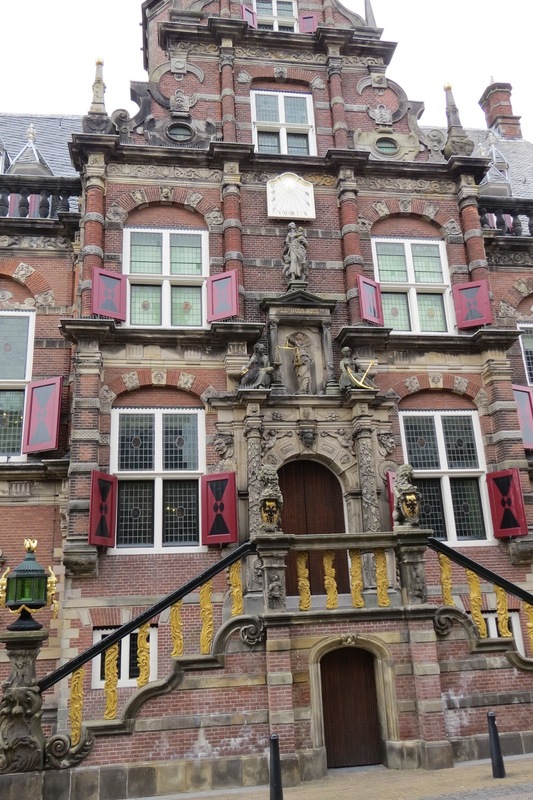 Accommodations are typical Dutch hospitality. No need to reserve long in advance, depending on the time of year, you can often phone the day before. Rooms can vary from a simple spare room to your own whole cottage. We’ve always had clean rooms, comfortable beds and a great breakfast. But – you can only arrive on foot or by bike. If you rent a car, you can’t use this organization. Annual membership fee is 8 euros and that includes the complete catalogue of 5,000 addresses and contact information. After having walked some 60 KMs this week, from village to village, we have arrived in Appelscha, Friesland. This is just across the provincial border. Lucky for us because not only does each region here have its own dialect and culture, it also has its own speciality foods. Now we enjoy Frisian sugarbread (gooey bread with lumps of sugar baked into it) AND Drents raisin bread (weighs as much as a brick). 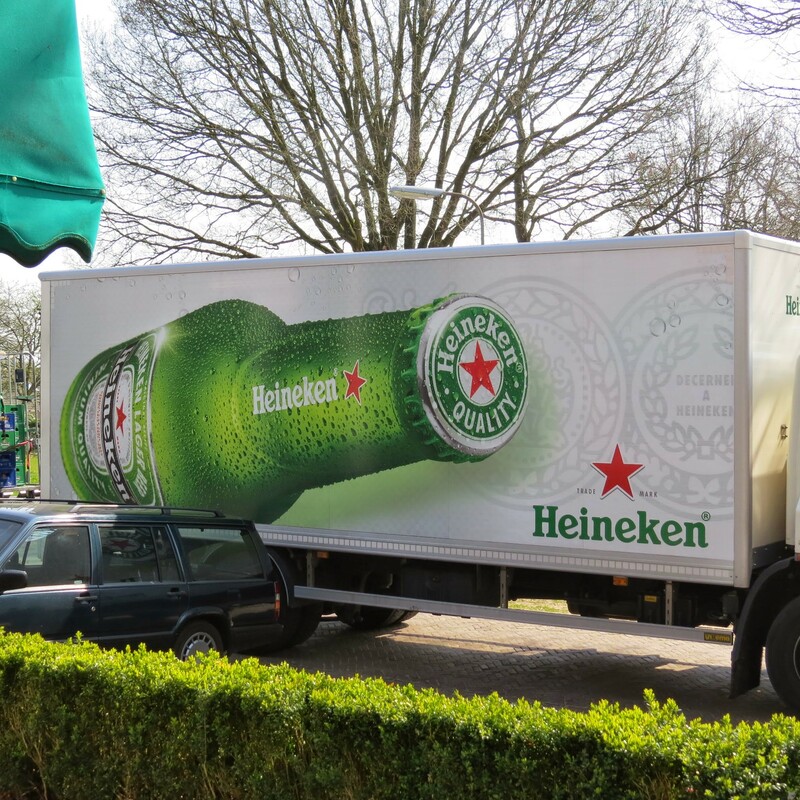 Not only do the Dutch brew Heineken and Grolsch, they also produce many local beers ranging from dark to blond to fruity. For this weekend we found a place to stay 2 nights, basically for the same price as the Friends On Bikes network plus dinner. The hotel had a special super deal that includes an elaborate breakfast and dinner. Since the forecast was for rain, we decided to stay in one place for two nights. Instead of walking tomorrow’s section of the Drenthe Pad, we rented bicycles. The Dutch have state of the art bicycles, including tires that will not pop anymore. Cost for a full day bike rental is 7 to 8 euros. We cycled through the village, across farm fields, national nature reserves, forests, a wild bird sanctuary and historic fields of peat moss. No less than 60 KM! Now, in addition to sore backs and feet, we also have sore butts and knees….Halfway it started to rain. 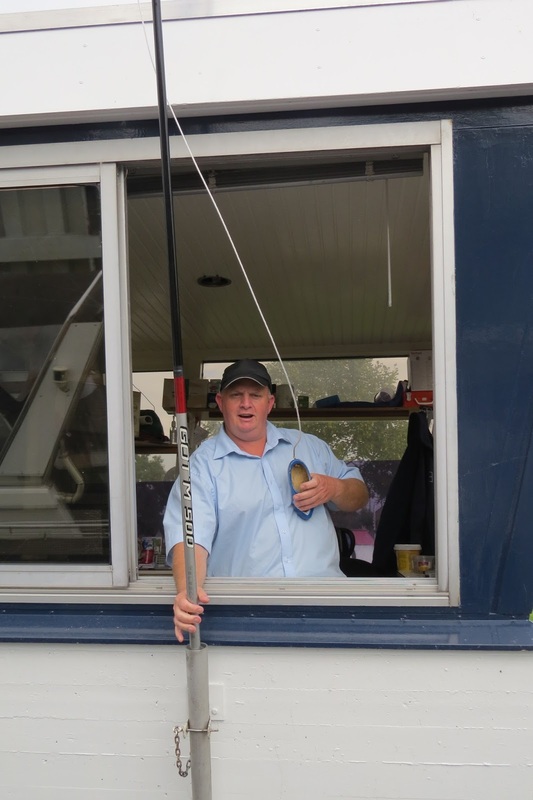 We donned our rain capes – thank goodness we did not carry them for 2 months without ever needing them! 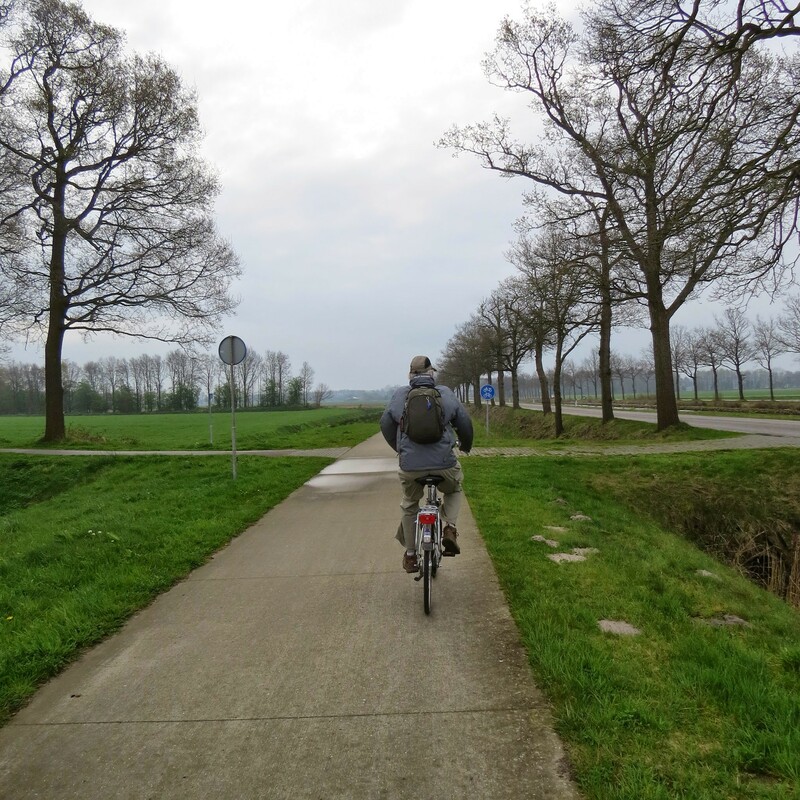 I never felt more Dutch than pushing the peddles across a windswept bike trail through the fields. Those bike trails are amazing. Our route for today looks like this: 60 – 65 – 72 – 73 – 79 – 91 – 84 – 65 – 60. Sounds like a secret code, doesn’t it? But it’s all you need to find your way across the country. It’s a mind boggling system of (mostly) paved or concrete bicycle trails. At an intersection you will see a small sign with a number, either the number of the path you are already on, or pointing to the next number you need to follow. Simple. Just don’t miss one. At major crossroads there is a large regional map showing you all the routes so that you can easily change or adapt the route you are on. Ingenious. And the best part is that most bicycle paths are away from roads or other traffic. Just you and nature. 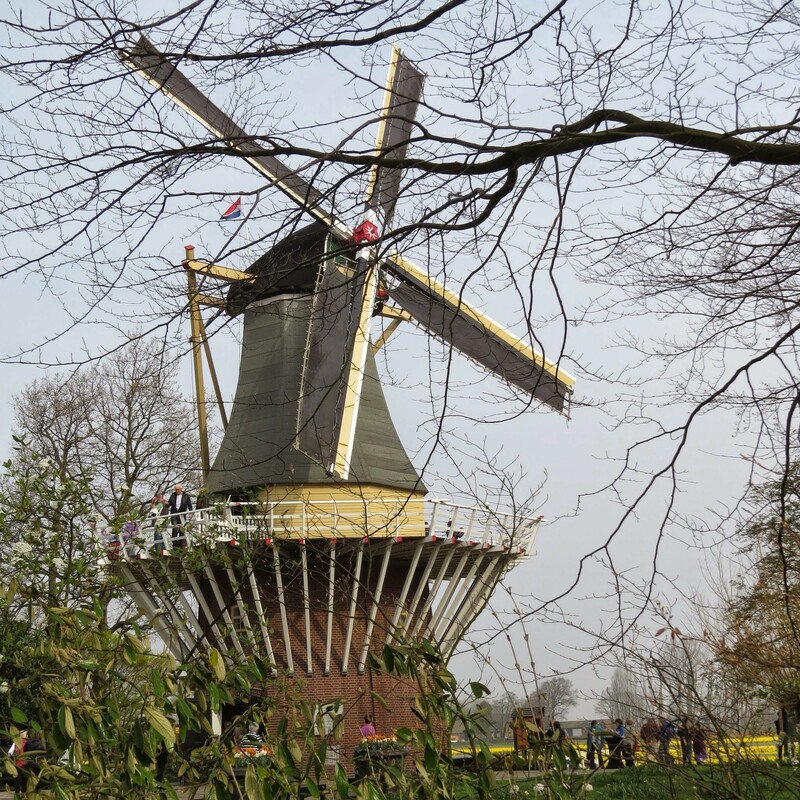 It’s a system of hiking and biking trails that the Netherlands can be proud of. And that more countries should adopt. 160 KM of hiking. Ten days. Fifteen kilo packs. Two blisters. Mostly it was fun because we took it easy. We slept in, had a lazy breakfast and still headed out on the trail by about 9 AM each day. No rush, no race. We stayed with the ‘Friends On Bikes’ accommodations which are just like B & B’s and allowed us to stay in different Dutch homes, meeting interesting people. We also stayed in a few small hotels and we enjoyed roaming the villages, visiting the bakery, sampling typical regional dishes. Holland may be a small, densely populated country but in Drenthe it is still very green and very quiet. There were days when we barely met other people on the trail. We visited the very cute village of Orvelte, which is more like an open-air-museum with its historic farms. There is a glassblower, an antique store, a cheese maker and much more. 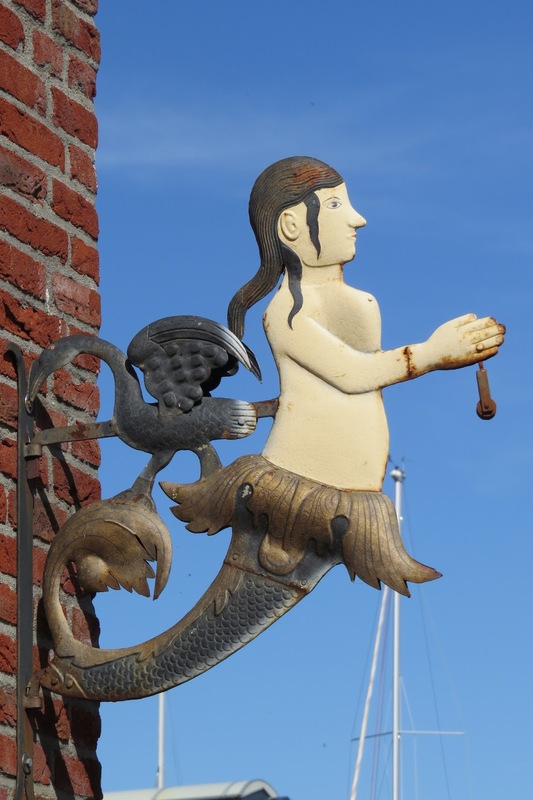 We toured a historic farms full of furniture and household items of at least a century ago. The tour included a very nice movie about the village and life as it has been here during the ages. This village is high on our list of recommendations, but only during the shoulder seasons. In high season it’s supposed to be very, very crowded! Several times while hiking across the moors and heather, we met large flock of sheep. No shepherd, just a very special local breed of sheep on skinny legs and with long tails. These sheep help keep down any invasive species and promote the growth and expansion of the heather. We also found large Highlander steers and cows with enormous horns on our path. The drawback of hiking in April was the fact that farmers were spreading manure. The smell was often overwhelming. We only had 2 days of rain so can’t complain. 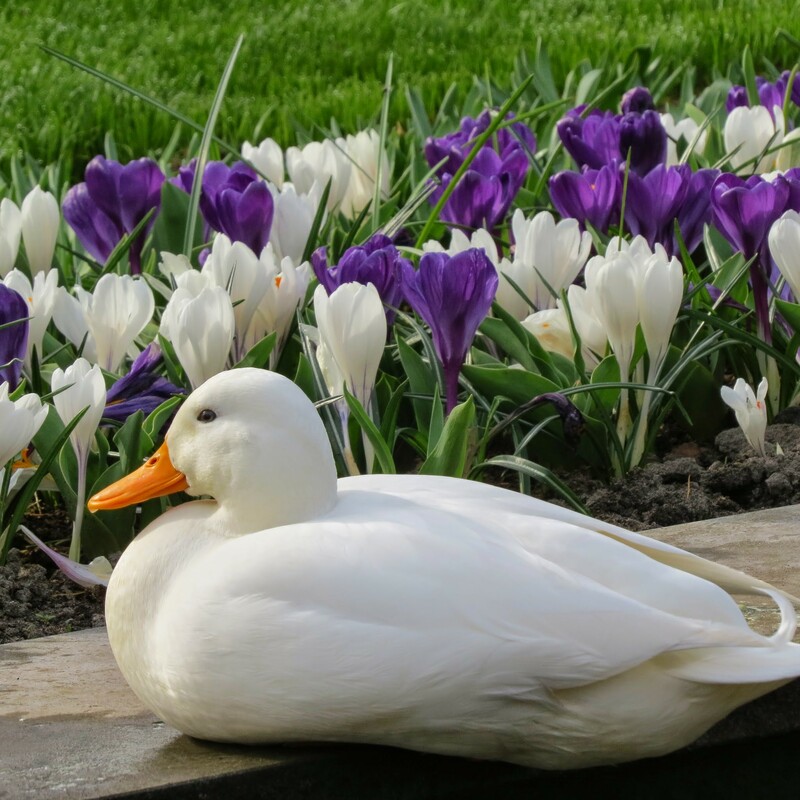 It was a sunny, early spring in Holland. One of our favorite events was being in a small village (Dwingeloo) while an age old tradition was going on: Palm Pasen or Palm Sunday, the week before Easter. The children of the town all showed up for a parade with wooden crosses, decorated with garlands of candy and flowers, crepe paper and topped with a rooster made of bread. When I was a child I made the same cross and joined a similar parade. It was fun to see this tradition continue. 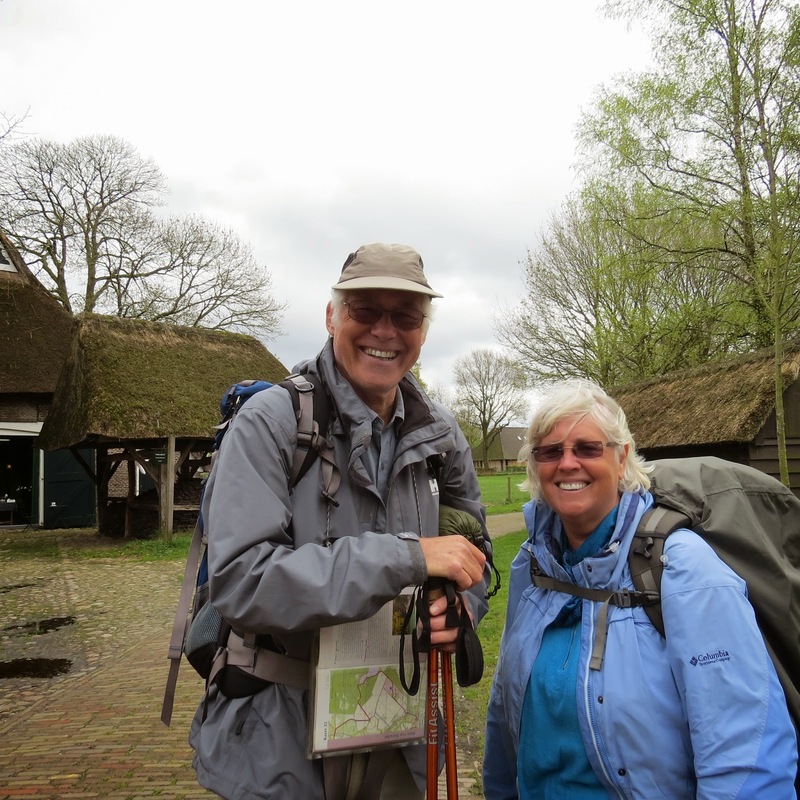 We completed about half of the Drenthe Trail and hope to hike the remainder soon. Next time I will carry much less weight and will make do with fewer clothes etc. The best piece of clothing I brought on this trip was a large scarf. It served as blanket in the plane, as shawl when it was cold and as head or shoulder cover in churches and mosques. citizenM is a new breed of international hotel, welcoming the mobile citizens of the world- the suits, weekenders, explorers, affair-havers and fashion-grabbers. Hhmm… wonder which catagory you would put yourself in? 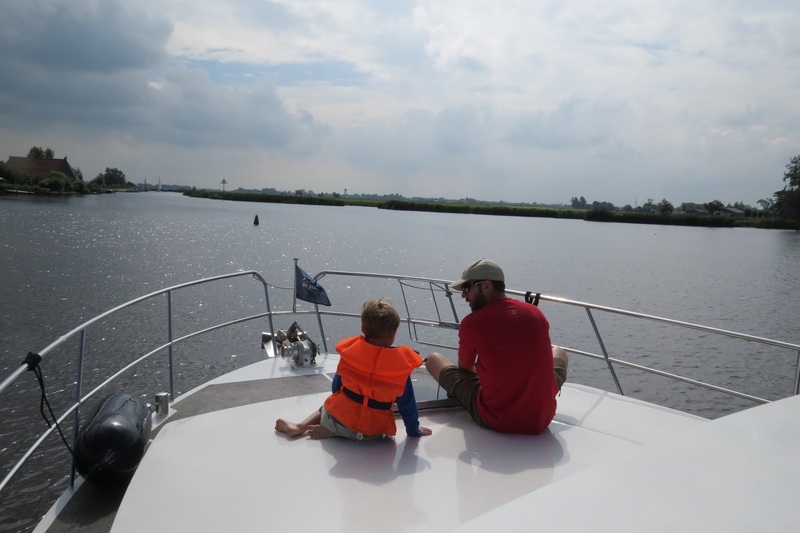 For now, we are headed home after an amazing two months of exploring. We can’t wait to hug the grandbabies, play with them and show them what we brought back. A real sign spotted in a Dutch forest!